Team Teasdale is Platinum Rated - The Platinum distinction reflects the highest level of service achievement in the industry. Platinum level professionals have earned 100% client satisfaction as measured by Leading Research Corp. This recognition is evaluated & awarded on an annual basis. After hundreds of independent surveys our Quality Service Rating on February 9, 2007 was 4.77 out of 5. According to industry standards this is very high. The Customer Satisfaction Rating The Customer Satisfaction Rating (CSR) is a number that reflects past client satisfaction of the service provided by a Quality Service Certified agent. It is calculated by averaging the overall satisfaction scores from the customer satisfaction surveys that are sent after a closing to sellers and buyers. The management of the survey process is conducted by Leading Research which is independent of the agent and agent's broker or company. This arm's length process assures the integrity of the data and the process. How does Quality Service Certification benefit the consumer? When consumers spend significant dollars for a service, they expect consistency, reliability, predictability and accountability from that professional service provider. Until now, the absence of service standards in the real estate industry contributed to the inconsistency of satisfaction and value experienced by the home seller and home buyer. Thus, the Quality Service Certification program was created to offer greater value for the home seller or home buyer by providing consistent, reliable, predictable and accountable service for every real estate transaction. This service is provided by a Quality Service Certified® real estate practitioner. What distinguishes a Quality Service Certified professional? To become Quality Service Certified, a real estate practitioner must attend the Quality Service Certification program, pass a written examination, and sign a commitment to follow a prescribed procedure that is presented and communicated in writing to every home seller and home buyer. Following the closing of each home sale or purchase, an independent research company sends the consumer a comprehensive survey asking critical questions about the details and overall satisfaction of service provided by the sales person and broker. The sales person's ability to maintain Quality Service Certified status is dependent upon satisfactory service evaluation feedback from those buyers and sellers. Below is the Utah Real Estate QSC Designation - Certified Gold Award. How is a Quality Service Certified Different? Most existing designations have been created for the benefit of the real estate practitioner to enhance image and credibility. Quality Service Certification exists for the benefit of the consumer - to insure a higher level of professional accountability, better service and greater service value. Most designations are earned one time and renew nearly automatically. 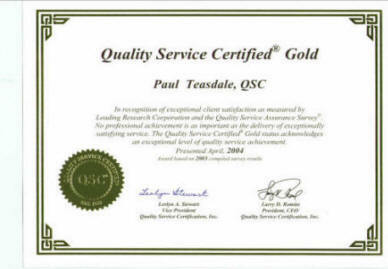 Quality Service Certified professional recognition is earned and maintained by meeting or exceeding a standard of ongoing quality service delivery each time a customer is served. That's quite a difference! 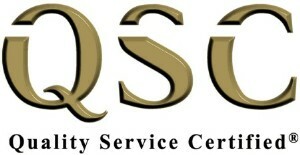 Do you want to hire a Utah Real Estate Agent that is QSC Certified?